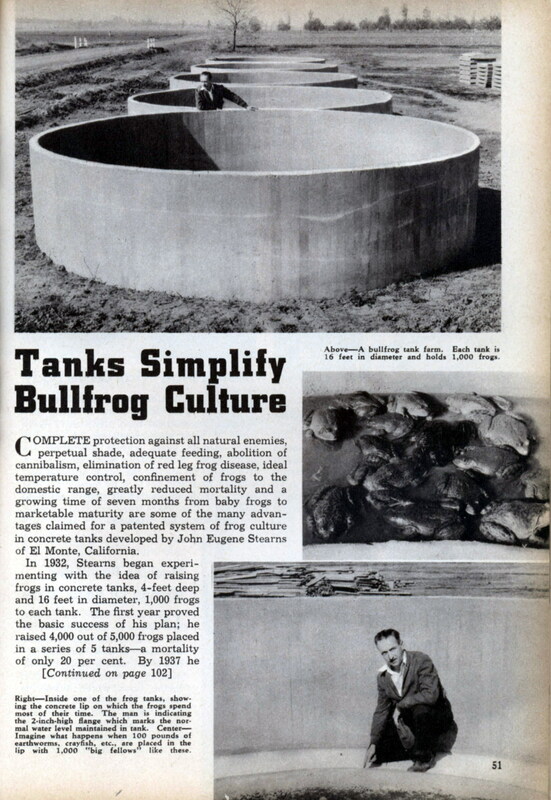 In 1932, Stearns began experimenting with the idea of raising frogs in concrete tanks, 4-feet deep and 16 feet in diameter, 1,000 frogs to each tank. The first year proved the basic success of his plan; he raised 4,000 out of 5,000 frogs placed in a series of 5 tanks-a mortality of only 20 per cent. By 1937 he succeeded in improving the mechanical operation of the tanks and raised nearly all of 7,000 frogs placed in seven tanks immediately after transformation from the tadpole stage. Not only had he reduced mortality almost to the vanishing point, but produced bullfrogs 20 to 22 inches in length overall, marketable frogs weighing three to three and one-half pounds each, ill the record time of seven months! With such frogs worth half a dollar each in Los Angeles markets that call for thousands while he could deliver only by hundreds, Stearns moved to Los Angeles County and is now engaged in setting up the Parker and Stearns Frog Farm near EI Monte. As these lines are written only five tanks have been completed toward the ultimate goal of 100, with a production of 100,000 marketable frogs every seven months. 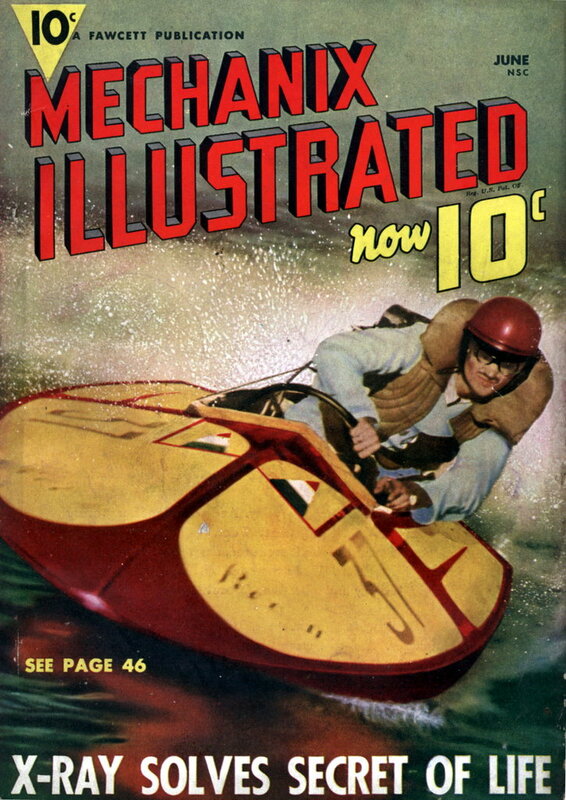 In addition to that income Steams is apparently destined to receive some handsome-patent royalties accruing from the use of his tanks and methods by frog farms in all parts of the nation. Under the Stearns system of bullfrog culture propagation follows most of the common practices of the last thirty or forty years up to the point of tadpole transformation. There are the usual spawning pools for breeders, tadpole ponds and food culture ponds for raising the living food required by frogs of all ages. Beyond the tadpole stage, however, the tank system comes into play as a radical departure from methods previously used by frog farmers. Baby frogs are carefully matched for size and placed 1,000 each in the series of tanks. Except for a concrete lip, 24-inches wide encircling the bottom inside the tank, 16-feet in diameter, the entire base of the tank is open. The frogs, it is claimed, derive certain benefits from this contact with the earth. This arrangement also creates a round, earth-lined pool, 18-inches deep and 12-feet in diameter at the bottom of the tank. By maintaining the water level at this depth in the center pool two inches of water is kept over the concrete lip. Since the frogs spend most of their time on the lip this depth of water creates the condition that frogs seem to like the ability to sit with their bodies partially submerged. The center pool is equipped with a four-inch drain pipe controlled by a valve outside the tank. Prior to feeding, an operation that is done only twice each week, approximately 100 pounds of live frog food (carp minnows, goldfish, large earthworms and crayfish seined from the food culture pools or taken from the earthworm culture beds in the case of earthworms) are liberated into the tank. It is the natural instinct of these creatures to move toward the wall of the tank. The drain valve is then opened and the water lowered to a depth of about two inches in the center pool. A series of small perforations in the flange of the concrete lip causes the water to drain from the lip completely. This leaves the living frog food “drydocked” on the lip – earthworms and crayfish crawling about and minnows flapping, completely at the mercy of the frogs. When this happens the scene inside the tank is one of tremendous activity – frogs jumping in all directions gorging themselves upon their helpless living prey. 1n a few minutes the 1,000 frogs obliterate every trace of the living food. The normal water level is then restored. The feeding operation also serves to make a thorough cleansing of the tank-frog excrement and other contaminations of the water being removed through the drain pipe when the water is lowered. Restoration of the normal water level replenishes the tank with pure water softened by having been put through a water-softening system. It is to this cleansing feature of the tank system of culture that Stearns attributes the complete freedom from disease of his tank-raised frogs no red leg, the disease that has ruined many a frog farmer-mortality from any cause reduced to negligibility. Frog tanks such as those depicted in the accompanying photos can be built for about $50 each, including the shed roof and all necessary fittings. That cost seems very nominal when weighed against the inventor’s accomplished demonstrations of a production of approximately $500 worth of frogs from each tank every seven months. The tank system of frog culture is essentially a mechanical method of accomplishing what successful frog farmers in Japan have long been doing with costly and elaborate equipment and endless hand labor. This is too too too funny! I want some BULLFROG CULTURE! Your choice of ads is excellent!